Design from an album of costume designs by Attilio Comelli (1858-1925) for a production of Babes in the Wood at the Theatre Royal Drury Lane in 1897. 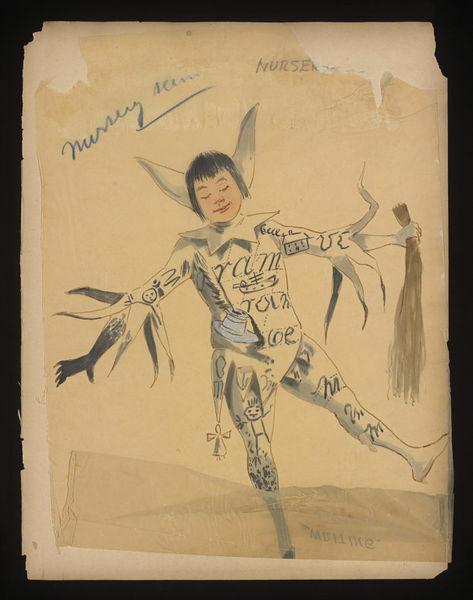 It shows the costume worn by Writing in 'The Nursery Scene'. 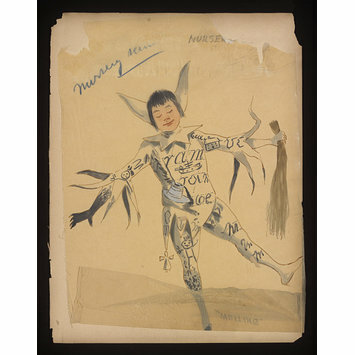 Design from an album of costume designs by Attilio Comelli (1858-1925) for a production of Babes in the Wood at the Theatre Royal Drury Lane in 1897. The design has been created with watercolour paint on tracing paper and mounted on paper. It shows the costume for 'Writing' in the Nursery Scene. The character is wearing a close fitting white costume consisting of a tunic and breeches, and with a headdress with upstanding ears, or devil horns. The surface of both the tunic and trousers are decorated in black with images and phrases connected with 'Writing'. Handwritten annotation in pencil, top right hand corner. Part of the paper missing. Handwritten annotation in blue pencil crayon, top left hand corner. Part of the paper missing.